Ahh, Tacos Muerte, fast food restaurant of choice for deadbeat boyfriends. This is for all the people that don’t think the hot sauces at fast food restaurants are hot enough, and crave a little more out of life. For those about to rock some spicy food, we salute you. 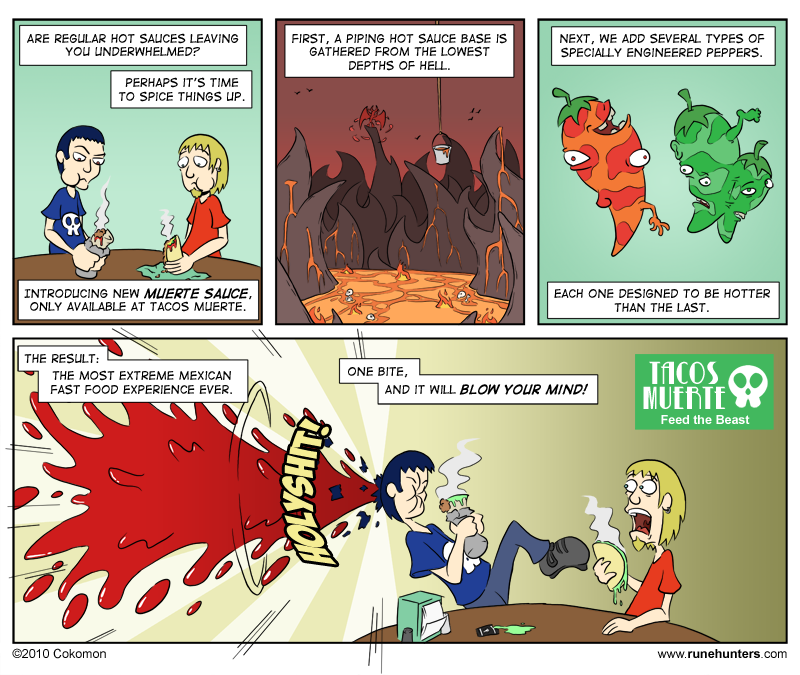 Tacos Muerte is a fictional restaurant of Radio Gosha. why do you keep making these comics? I WANT THE TRUE STORY LINE! I know, I know. You’re not the only one. I’m sorry for the incredibly long break I took and plan on getting back to the Rune Hunters story. I hope I didn’t upset you too much. I made a post on the front page explaining what was up.